Catering to one of the most basic human functions, the provision of washroom facilities is something that needs to be thought of in nearly every public building and space. However, anyone who has used a public toilet facility before will know the spectrum of states bathrooms can come in, and as such, we all appreciate a well maintained, and well-designed facility. A well-designed bathroom may not be at the top of your list when planning the layout of your site, but it should be. Public washrooms that are hygienic, welcoming, and above all, provide a high level of privacy to ensure all users feel comfortable, can have a huge impact on visitors’ experience of the rest of the building. Why do people want privacy? Sufferers from ‘shy-bladder syndrome’, people with disabilities, older people, and those with children can feel especially excluded without the adequate provision of washroom facilities. Whilst everyone may need facilities when using public spaces, these groups in particular may feel a need to know where and what type of facilities are available before leaving the house, and in fact may feel discouraged to leave if the appropriate spaces are not provided. Many men and women experience social anxiety or ‘shy-bladder syndrome’ due to lack of sound privacy, lack of visual privacy, or inadequate locks. Men can experience discomfort when urinals are placed too closely together, or if they have to stand next to another man, with no modesty screens. Across the world, the basic need of humans to void is still very much a taboo subject, treated with embarrassment and humour. From a young age, humans are taught that going to the toilet is a private thing one does on one’s own, and as such a need for privacy is a priority throughout our lives. Creating a space that allows humans to feel comfortable in their need for privacy should be basic requirement when designing public washrooms. The issue of privacy is of particular concern when it comes to the layout of washroom facilities in public spaces, specifically the layout regarding men’s urinals. A number of studies have found that men can experience shy-bladder and discomfort when forced to stand too closely to another man when at the urinals, particularly when there are no physical barriers between urinals. What’s more, it is important for designers to consider the layout of the bathroom in relation to urinals, cubicles and sinks. Ideally, urinals should be placed at the back of the room, so that men do not have to pass behind others to access cubicles or sinks. Many public toilets are placed in discreet, hidden areas. However, from a safety perspective, more visibility reduces the risk of vandalism, and can make people feel safer and more likely to use the facilities. They should not be hidden in any location that does not offer natural surveillance, for example, behind the back of buildings, or in isolated areas, but toilets should not be placed without any respect for discretion, either, such as directly onto a public pathway. People tend to feel more comfortable in a public space that has been made to feel like home, and this can also reduce the chance of vandalism. Rather than adopting the sterile look found in many public buildings, why not extend your company’s branding into the bathrooms? Fun colours, music, and flattering lighting can all help people feel much more at ease when visiting the facilities. There are a large number of differences to be found in toilet cubicles across the world – view our infographic on this subject here. From China’s total lack of cubicles – and toilets as we know them in the western world – to full-height cubicle doors, to the more commonly seen stalls with gaps above and below the door, there are a number of factors to consider when choosing the right toilet stalls for your building. 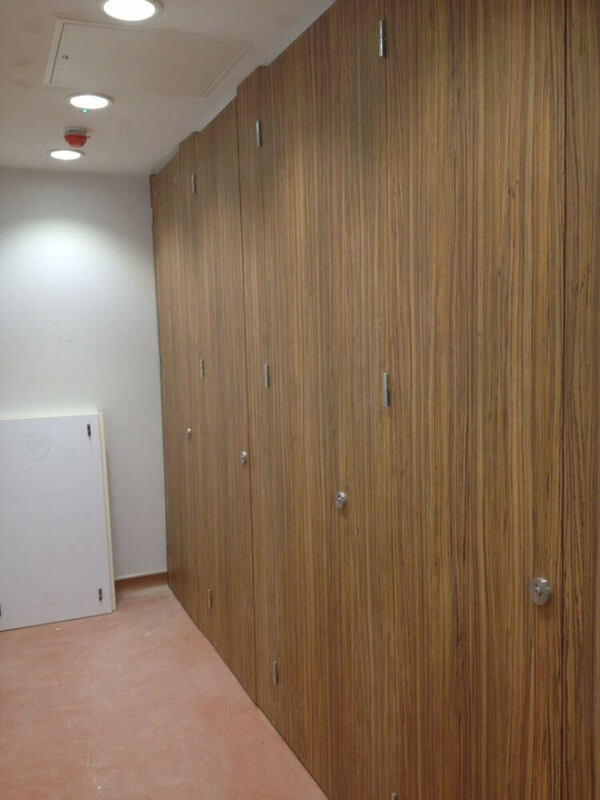 Whilst full-height doors provide better privacy and can help people feel more comfortable when visiting the washrooms, cubicles with gaps can be more cost-effective, and also reduce the likelihood of antisocial behaviour or vandalism occurring. People can experience discomfort in public washrooms when in the presence of total silence – the fear of being heard is very real for some people. To tackle this, choose a full height cubicle system to eliminate noise. Where possible, adding a soundtrack to the facilities with neutral music or tones can be an effective way of creating a more comfortable environment for people to be in. For some buildings, such as offices and workplaces, the toilets may also be used as a changing room. Therefore, a high level of quality and privacy is to be expected from these facilities in order for staff to be able to shower/wash before work should they cycle or walk in, to groom in preparation for meetings, and to provide a private space to use away from clients and colleagues. 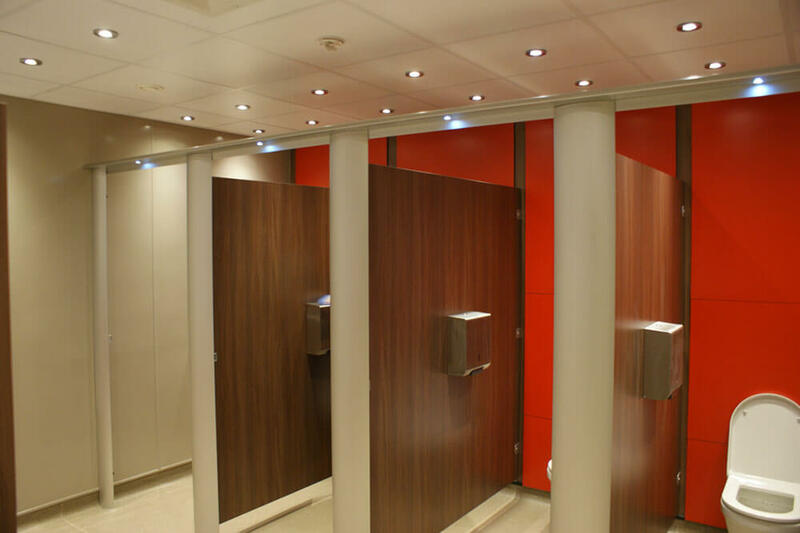 Spectrum Interiors are a leading provider of washroom refurbishment and installations, having provided our quality services to a range of clients in the education, medical, public, and leisure sectors. We’ve worked on a number of large scale projects, creating an expert design that takes every important aspect of a large public washroom into consideration. If you’d like to discuss your washroom refurbishment or interior design requirements, contact us today on 0800 030 6041 and our experienced advisors will happily advise you on the best solution for your needs.